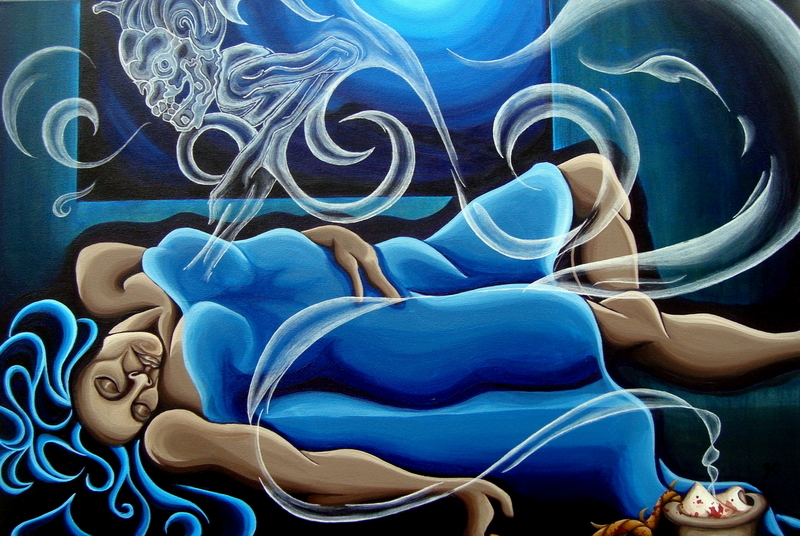 Zamara Cuyún is a self-taught, Minneapolis born-and-raised, Guatemalan-American painter working with acrylics. She incorporates elements of Maya and European myth, ideology, and iconography - sometimes to explore and create a vibrant, colorful, imaginary dream universe and, at other times, to represent the restless, violent, and unsettling world we are often forced to inhabit. I look to the past - to the collective roots of my ancestral tree - to inspire and inform my creations. 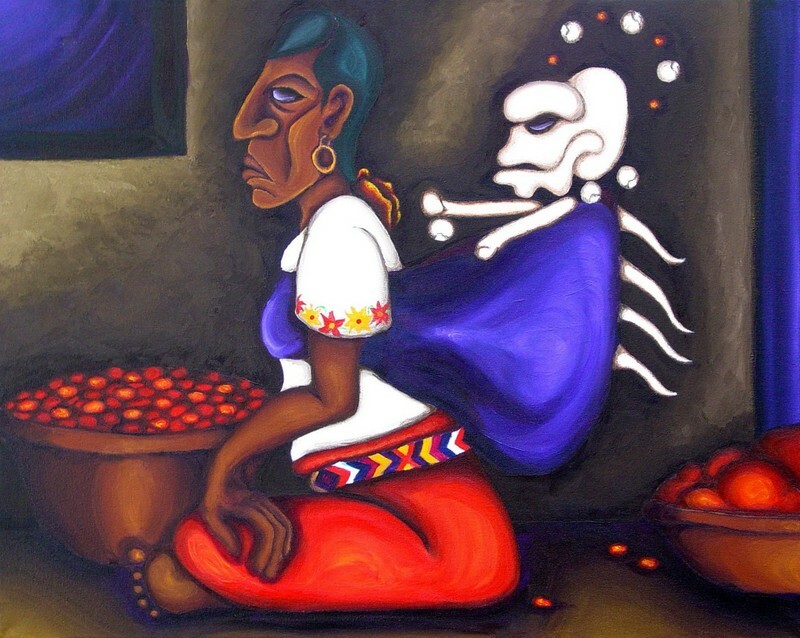 As a Grimm (literally) on my mother’s side, and Guatemalan on my father’s side, I strive to create pieces that meld indigenous Maya mythical traditions regarding cycles of life, death, and rebirth with the popular legends born of the interaction of Maya, Spaniard, and African in the Americas, as well as the folklore of Germany and other Western traditions. On the more technical side of things, color and light are of the utmost importance in my work. I want my subjects – the lovely, as well as the gruesome – to pulse with color, light, and life from within. Vibrant Guatemalan indigenous textiles and folk-art, as well as European stained-glass and Rosemaling inspire and inform my use of color and brushstroke. My current work continues to follow this same path, although I have departed thematically from the more mythical to focus on something more concretely socio-political in nature. I am periodically drawn back to using my work as a tool to educate, explore, and protest. In light of current events in Guatemala, I have been thinking more recently about indigenous identity (my own, as well as that represented in Guatemalan society and in the U.S.), the history of racism, colonization and resistance, the persecution and genocide of the indigenous population, and the call for social justice, reconciliation, and revitalization. I feel compelled to process this information through my art and communicate with a larger audience regarding these issues. This portion of my work is definitely not something a person might feel comfortable hanging in their home, perhaps, but in some ways it is, to me, much more urgent in nature. I’m also learning to “let go” a little, stylistically – which is incredibly difficult for a perfectionist – allowing the artwork and the process to deviate from the original plan I had when I first envisioned it. My most current painting in progress is what I would consider “unfinished” – not polished, not complete, not perfect. It’s telling me what it wants to be. To “complete” it would destroy the story it wants to tell and the mood it wants to convey. I didn’t decide that this is what I was going to do until about five years ago. I took a few art classes in high school and it was really my teachers that recognized my talent and encouraged me to continue painting. I left it for awhile, completed a degree in anthropology and archaeology, and took the odd art history class here and there. Then, one day, I decided to pick up a paintbrush again and I haven’t stopped since. I am terribly slow (being a perfectionist) and easily distracted, so my output isn’t quite where I would like it to be yet. Someone once told me that an artist should exercise their art as they would a muscle. You should sit down and draw or paint or whatever it is you do at least once a day to stay limber and strong. I have good intentions of following this advice but, like I said, I’m easily distracted. Oh – and even more importantly, it doesn’t matter if anyone else likes it, if you need to paint it, then you should. I do need to be better about marketing myself. I’m not very tech-savvy either. That said, I do show my work from time to time in local coffee shops and galleries and that’s where I do make the majority of my sales. People have also contacted me via email zcuyun at hotmail.com to make purchases and commission work. You can also find me on mnartists.org, http://www.mnartists.org/Zamara_Cuyun and facebook, https://www.facebook.com/zamara.cuyun (but then you’d have to “friend” me). More often than not, however, I find the act of sharing my work with the public more gratifying than the financial rewards. Since I live in Minneapolis, we’d definitely go to the MIA http://new.artsmia.org/ and the Walker http://www.walkerart.org/, including the sculpture garden. I just discovered this year that the Red Hot Art Festival (http://redhotart.org/) is my favorite art fair in Minneapolis. The Casket Arts Building http://www.casketarts.com/, Intermedia Arts http://intermediaarts.org/, and Soo Vac http://www.soovac.org/ are some of my favorite places to go to enjoy great art and get inspired. I also really enjoy surprise encounters with local talent showing in coffee shops, restaurants, and galleries around the Twin Cities. Public art abounds without even having to hunt it down. MNartists.org http://www.mnartists.org/ is a great resource! I have to credit them with getting me up and running. I’m also a fan of MNOriginal http://www.mnoriginal.org/ and go to the online site to see what’s going on in Minnesota. On Friday, November 1st, 7-10pm, I am participating as the featured artist for Altered Esthetics “Día de los Muertos,” a celebration of “the lives of those we have lost.” I am really looking forward to it. Then, from November 11 through January 5, I am planning to exhibit some pieces over at the Coffee Grounds Gallery http://www.thecoffeegrounds.net/.